At Agri-hub, we have more than 60 years’ combined experience of writing for the farming press. 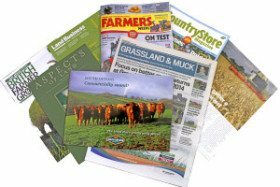 Our journalists are regular contributors to publications like Farmers Guardian, Crop Production Magazine, British Farmer & Grower, Farm Business and The Furrow. We know what editors need from an article. It must be well written, balanced, and newsworthy; drawing on the knowledge of industry experts and with muddy-boots case studies. Photos, and, increasingly, videos, complete the package. Having branched into PR consultancy work, we have found the most successful campaigns are those that match up the client’s wish to raise their profile with the editor’s need for professionally written copy. Agri-hub is simply an extension of that service, drawing upon a much larger client base and providing a direct link into the farming and rural press. It is FREE to join and fees are only paid for articles that are commissioned. Read some of our articles here. The world of media is changing: Budget and time constraints mean it is increasingly challenging for the farming and rural press to produce top-quality articles that inform and inspire their readers. At the same time, advertising budgets are under pressure, leaving agricultural businesses seeking new ways to raise their profile and reach out to their customers. Agri-hub brings those two needs together, drawing on the expertise of the industry to provide low-cost articles to the farming and rural press, while at the same time raising the profile of featured businesses. We DO NOT deal in advertorials or PR puff. We DO provide professional, balanced articles that meet the needs of journalists and PR clients alike. Read some of our testimonials here.